Is It Time For The Olympics? In 2010 and 2014, I chose to participate in the Olympic Knitting Challenge. You know the one. You cast on for a project during the opening ceremonies and if finished before the end of the closing ceremonies, Voila! you are a knitting Olympian. 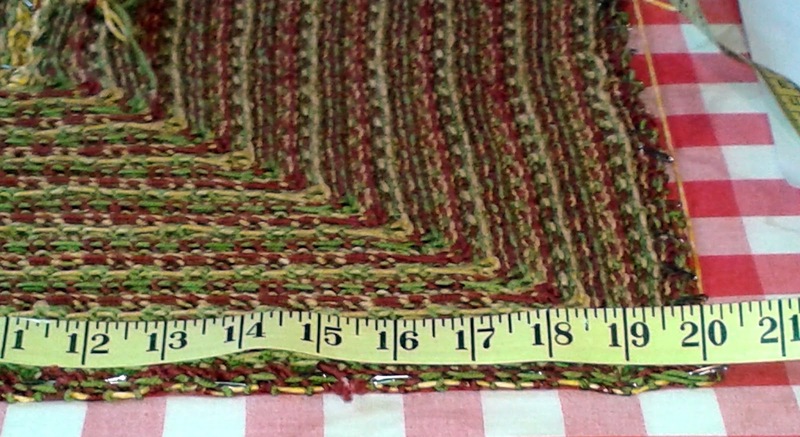 In 2010, I knit Elizabeth Zimmermann's Green Sweater. 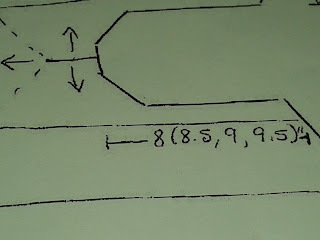 Sport weight yarn and 'different' construction. I knit and knit and knit. I finished in time but I had sore arms, sore wrists, sore shoulders. 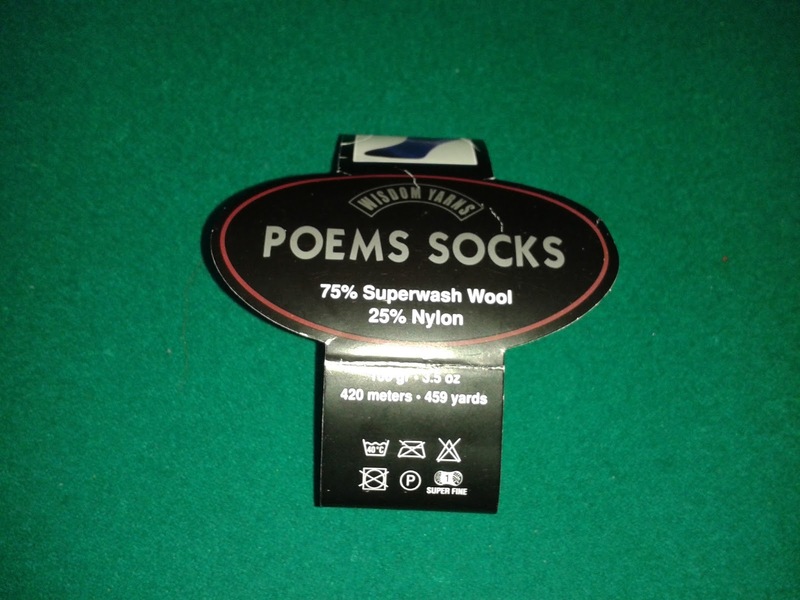 In 2014, I wisely chose a heavier yarn. 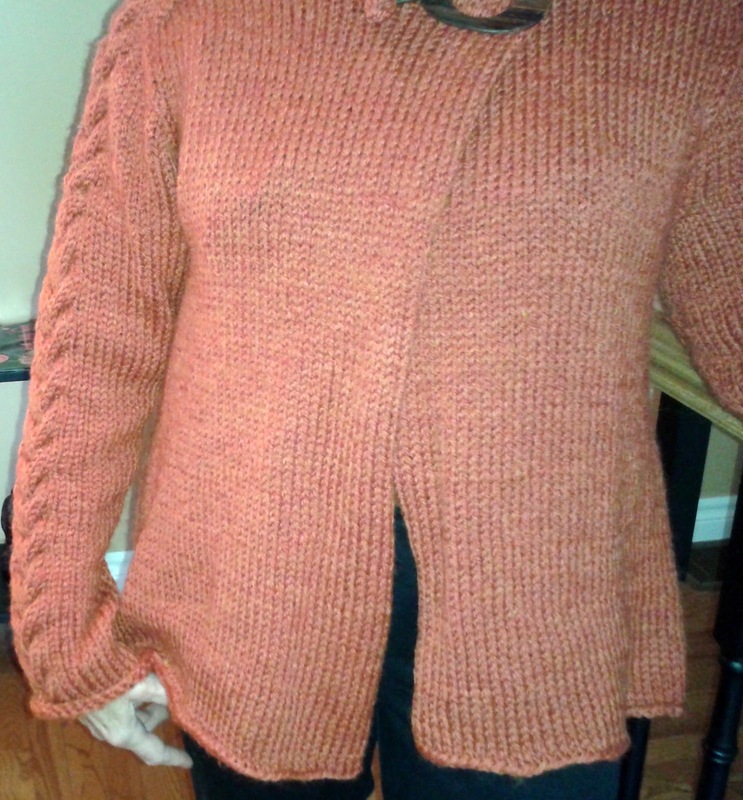 I knit a sweater with chunky weight yarn, BUT with lace work. It, I finished without as much pain and even with a teeny bit of time to spare. 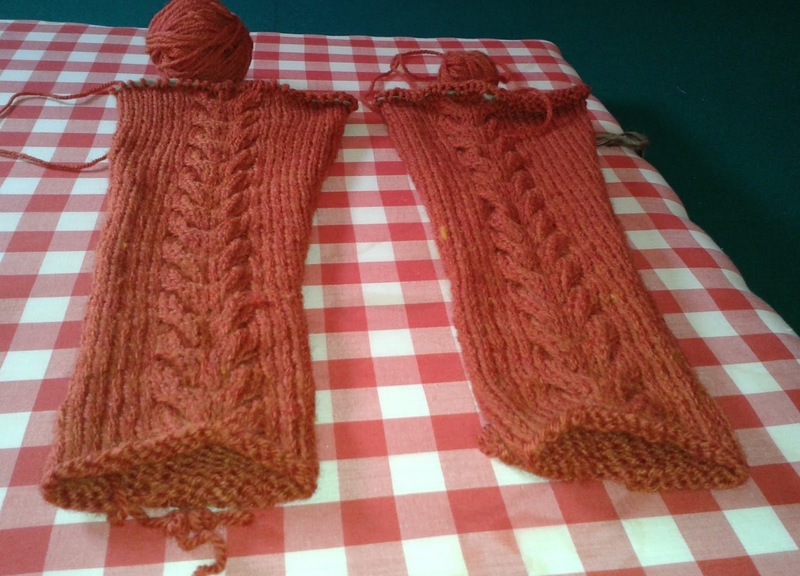 But neither of the above sweaters could come close to the speedy finish of Glenora. Started Thursday September 17 and finished Sunday September 27. Ten days. A record for me. Mind you twice as long as it took the designer. She reports knitting one of her versions in 5 days. No fair! I ate and slept. 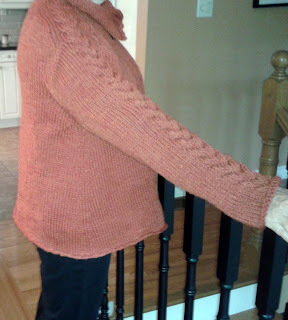 Glenora too is knit with Chunky weight yarn but it is a very unstructured design. A no-sew unstructured design. The end product has a very 'organic' look. I love it. 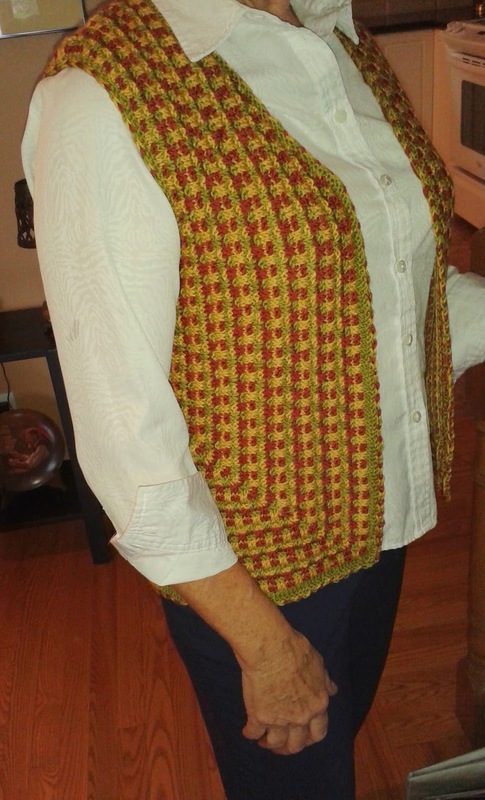 Pattern: Glenora by Elizabeth McCarten. A great design. 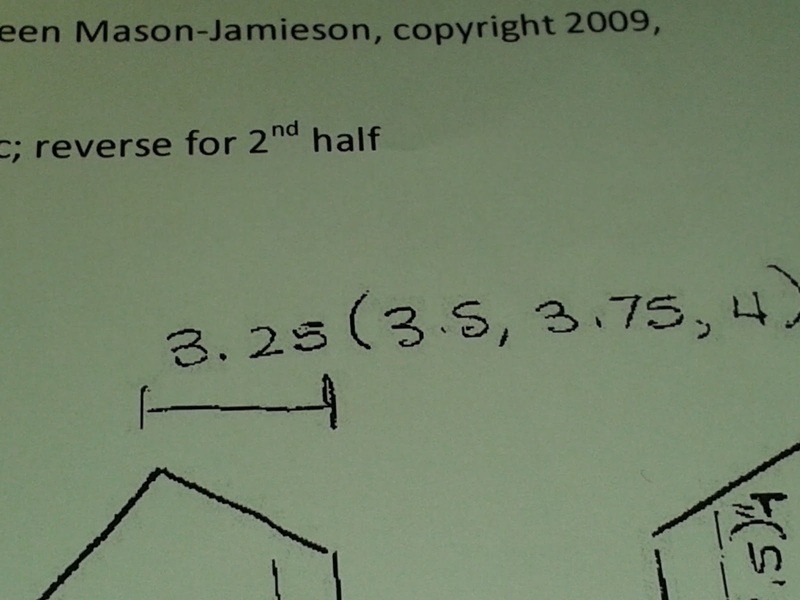 A well written pattern. Yarn: Sable Soft by Kertzer. I purchased mine several years ago intending to knit a different design. I knit the back, two sleeves and one front before abandoning it as something that looked better on paper than knitted up. Mods: None. I knit Glenora exactly as the pattern suggested. Yikes. Who am I and what the heck did I do with Brenda? Next Time: The collar of Glenora is knit as one with the sweater. As such, when it rolls, the underside is what you see. This could be righted simply by reversing the wrong and right side rows once the collar is started. But then, would it looks as 'organic' as the designer planned? 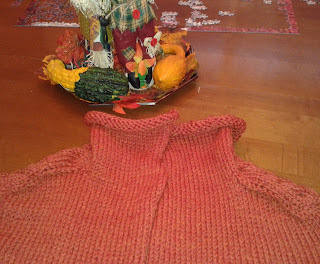 Below, you see the sleeves above the shoulders as the cable that is a feature of both sleeves and collar continues on to form part of the collar. Unique and great design. Thanks, Elizabeth. 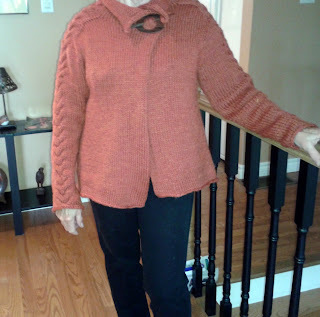 What I like about my Glenora: It has, as Elizabeth states, a nice close fit in the bust and shoulders while at the same time a lovely A-line flare to the bottom. The combination of the close-fitting top with the bottom looseness, gives Glenora a delightfully modern, stylish flare. I like it. Mine is very light-weight. This is in part due, no doubt, to the yarn I chose. But the slightly larger- than-normal needle helps too. 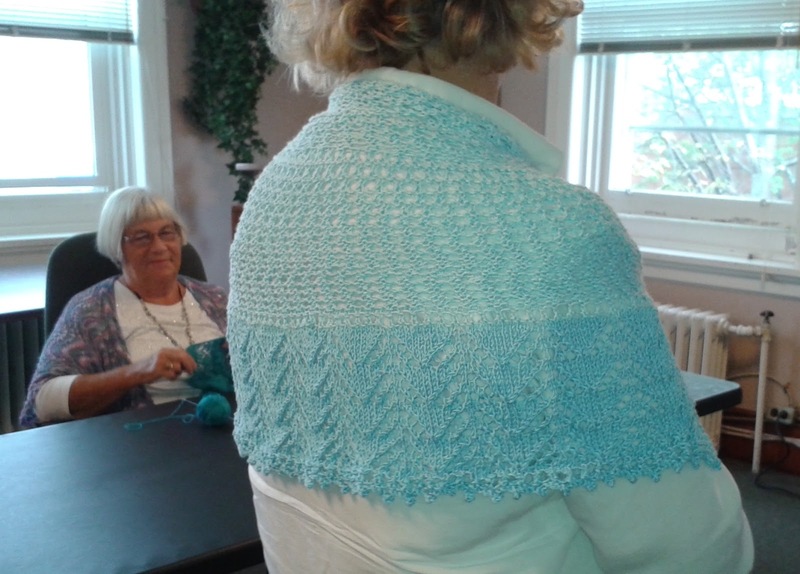 Glenora is designed for speed knitting. It is a one-piece, no-sew design with no finishes. 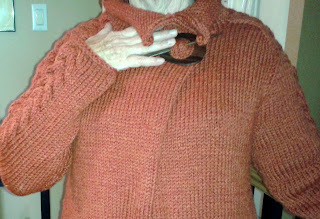 No bottom or cuff ribbing, no button bands. No trim of any kind. Above, you see the bottom, cuff and centre fronts. All trim-less. The collar is worked as simply an extension of the sweater. Draped over the back of the chesterfield, it is easy to see how the collar simply grows out of the sweater. A totally trim-less sweater. The non-finished edges help to give Glenora its very modern look. And certainly helps with making it a quick knit. 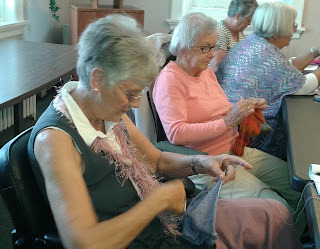 Elizabeth shows Glenora closing only at the top of the sweater with either a shawl pin or three buttons. I love that partially unbuttoned look. It makes Glenora appear to be and feel like an 'easy' wear. I have closed mine here with a shawl pin, but am off this afternoon to buy buttons. Three gorgeous buttons. I have been wanting an autumn sweater and Glenora fits the bill perfectly. It was a fun knit, a quick knit. Perfect for my next Olympic project. Because I can sure see more of these in my wardrobe. 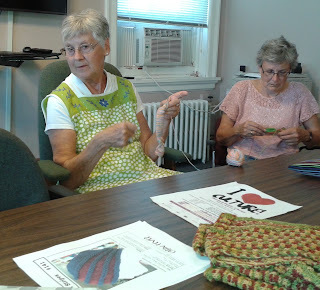 Normally, knit group is the only activity that occurs on my Thursdays. But today was a big day in this small town life I live. The Meaford library hosted a 'Learn To Make An Autumn Wreath' workshop over the lunch hour. Of course several knitters signed up for that. 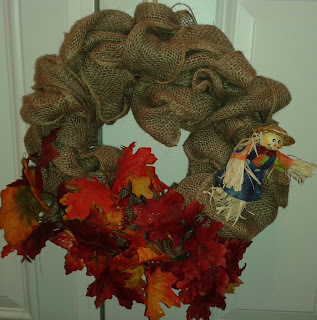 This is my 'Ten Minute Wreath'. Mind you, the online instructor was the only person finished in ten minutes. The rest of us took an hour. 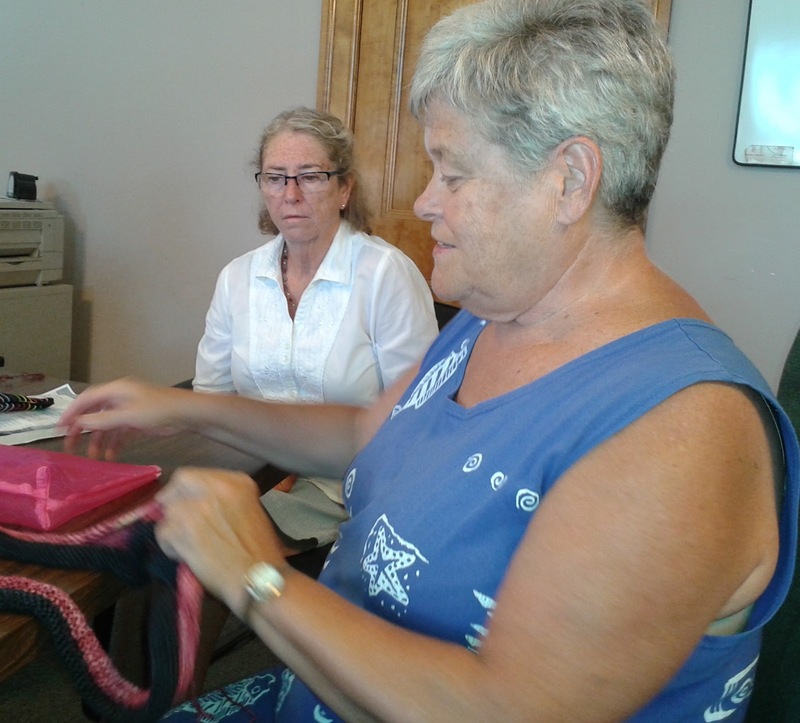 Later in the afternoon, it was the first movie of the season for the Meaford Thursday Flicks Club. Of course several knitters signed up for that. I left home about 11:30 and returned after the beginning of the 6 o'clock news. Poor Fred. In between these two special happenings, we had knitting. 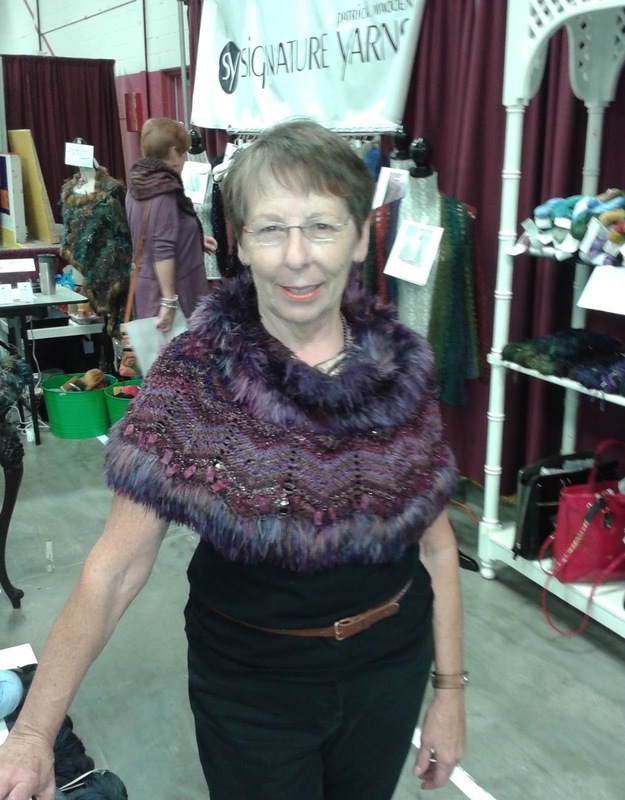 Sandy models another of her gorgeous shawls. This one, though, she doesn't like. 'An old lady's shawl' she says. It is the shape that makes it so in her eyes, she told me - Sandy prefers rectangular or triangular shapes for her shawls. 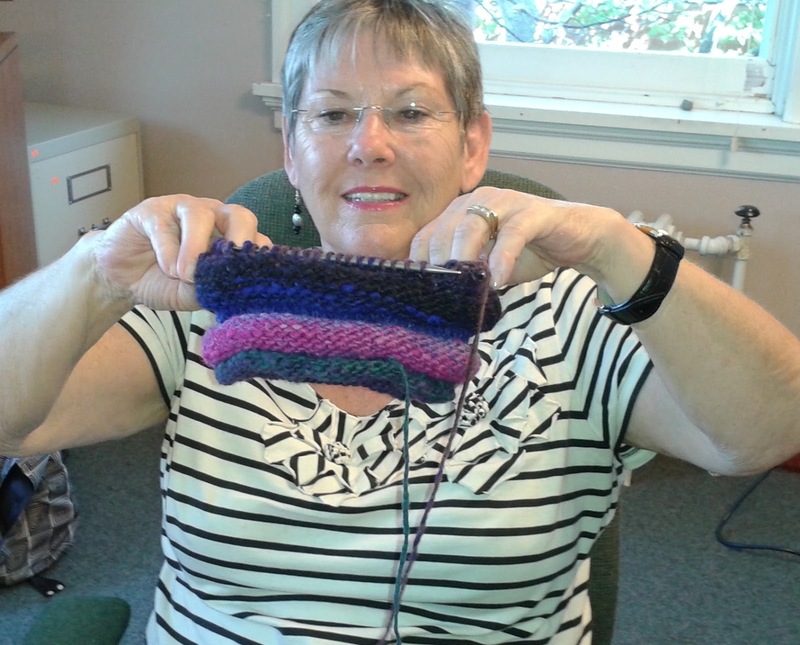 Sandy has asked Gail to give the shawl to one of knit group's friends. At 88 years of age, the lady no longer comes out to knit group. Laughing, I asked Gail how she was going to present the 'old lady' shawl to the old lady. 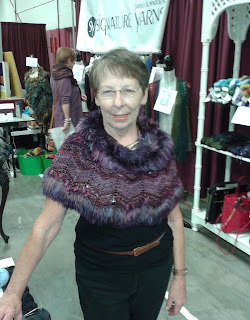 Gail, ever gracious, said she will simply say" Sandy knit this shawl and asked me to give it to you." Sharon R finished one of the three Noro hats from the kits she purchased at the Knitters Fair. 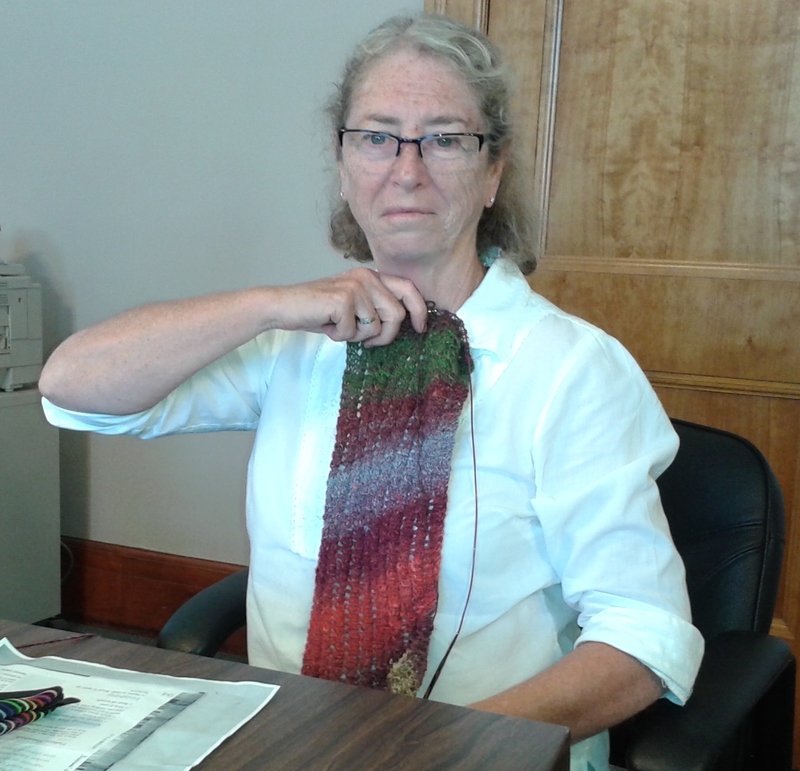 She said the seller had calculated the amount of Noro almost to the stitch. She had about 12 inches left over. 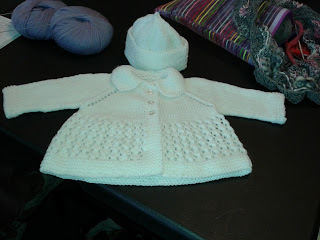 Along with the hat, Sharon managed to finish this little baby sweater and togue. 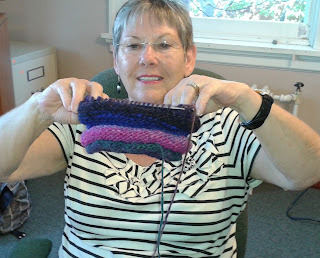 Sharon is our knitter that aspires to learn something new with each project. 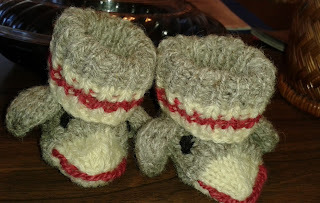 I asked her what she learned while knitting this Cabin Fever baby pattern. " I learned how easy top-down, no-sew knitting is" she said. No argument from me, Sharon. Isn't this a pretty sight? A row of knitters concentrating on their knitting and some of them wearing their knitting. Sorry about the delay in posting this Thursday post. Blogger gave me grief. Instead of posting, it ate my work. A couple of weeks ago, I spotted a new design by Elizabeth McCarten on ravelry. Glenora. Elizabeth referred to it as a 'relative of' and 'an unstructured version of ' one of her previous patterns, Petrova. It has been a long time since I have fallen so completely in love with a pattern. I love the loose look, the easy-wear look, the warm-yet-not-heavy look of Glenora. 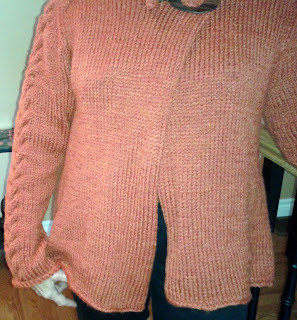 And in the rust-coloured Chunky-weight, wool/acrylic blend that has been in my stash for years, it would make the perfect fall piece. 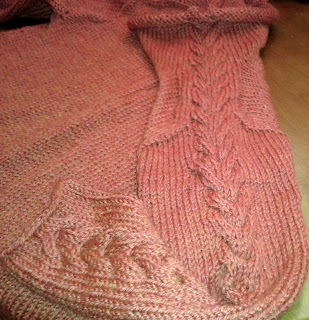 I fell so completely in love that I cast aside all my preciously-planned, next-in-line projects and as soon as the Serendipity Vest was finished, cast on for Glenora. What a fun knit! 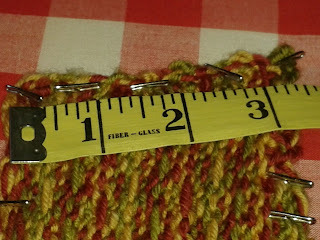 Chunky-weight yarn and 6.5mm needles saw me finishing the first sleeve in one day. Two days for both of them. Wow. No sleeve island slump for me. The body comes next, and starts at the bottom, which is 11 inches wider than the bust. 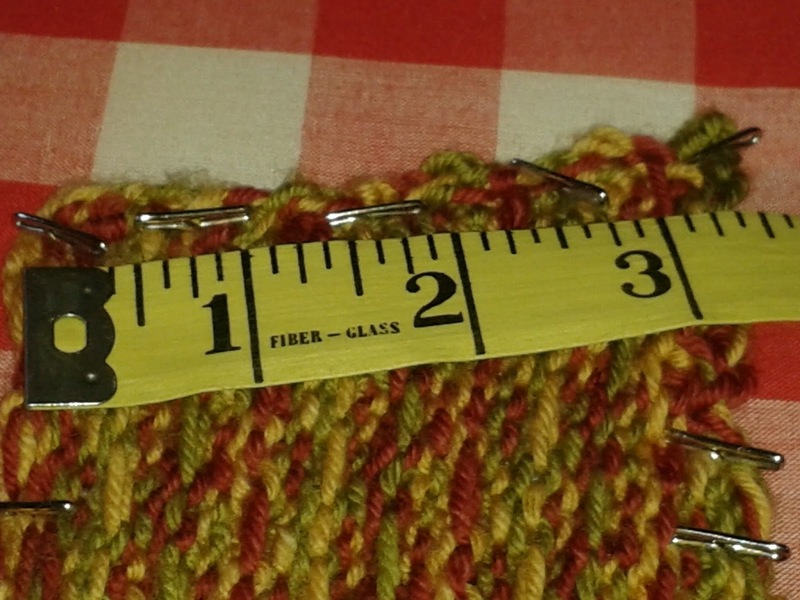 Despite all those stitches, after a Sunday start, I had almost 11 inches done as of Tuesday evening. Wow. While I won't be finished in a week I suspect it won't be much longer. 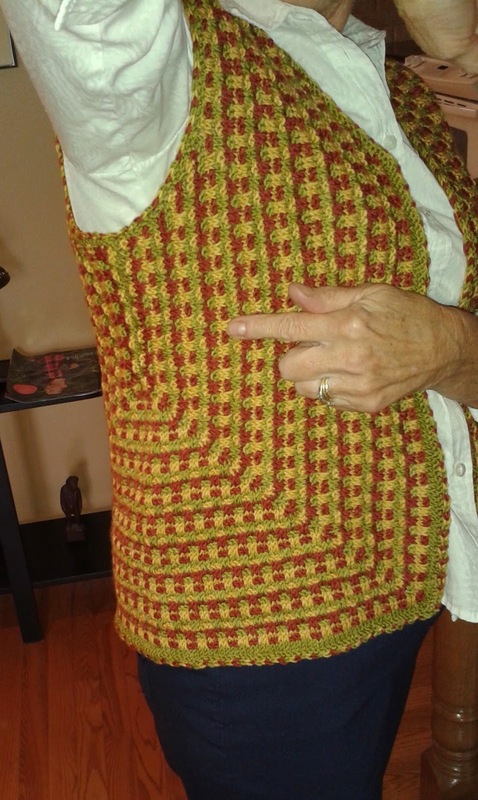 Thanks, Elizabeth for a great pattern. Oh - did I mention that it's free? Serendipity Vest gave me great grief. 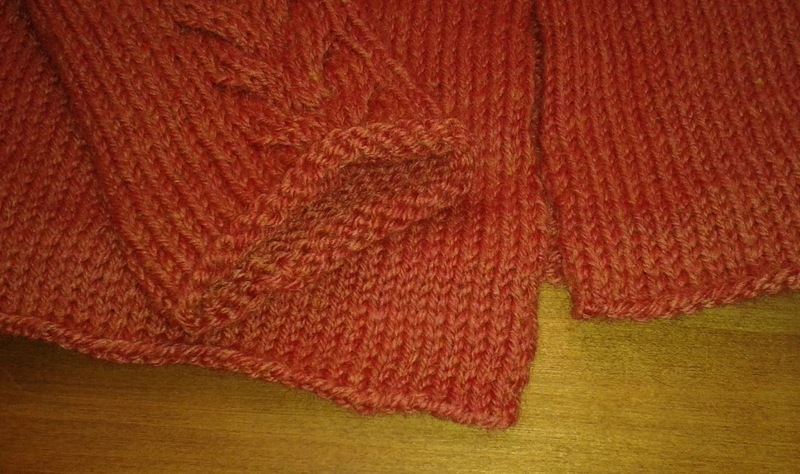 Re-knit more times than I like to think about, due to what I found to be a pattern severely lacking in clarity. Missing information and poorly described instructions were just a few pattern problems. Mind you. It could be me. Just me. I am a graduate of the "Brevity is the soul of wit' school. 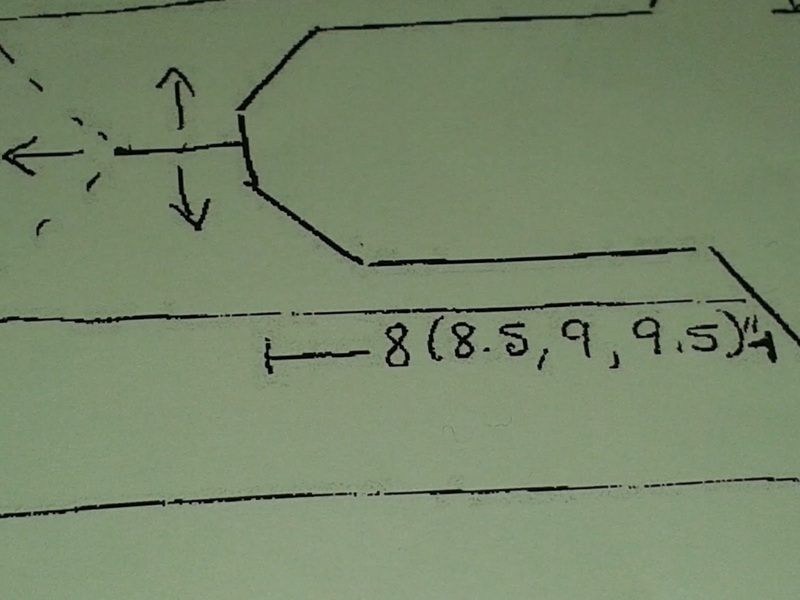 Serendipity contains 8 pages. 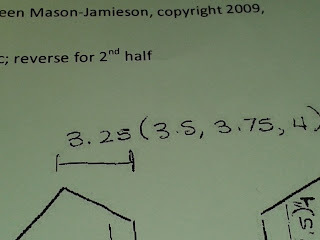 My old school teacher days taught me to always start with the simple and work up to the complex. Serendipity served to confuse me from the get-go. Despite all the grief, it is finished and I love it! 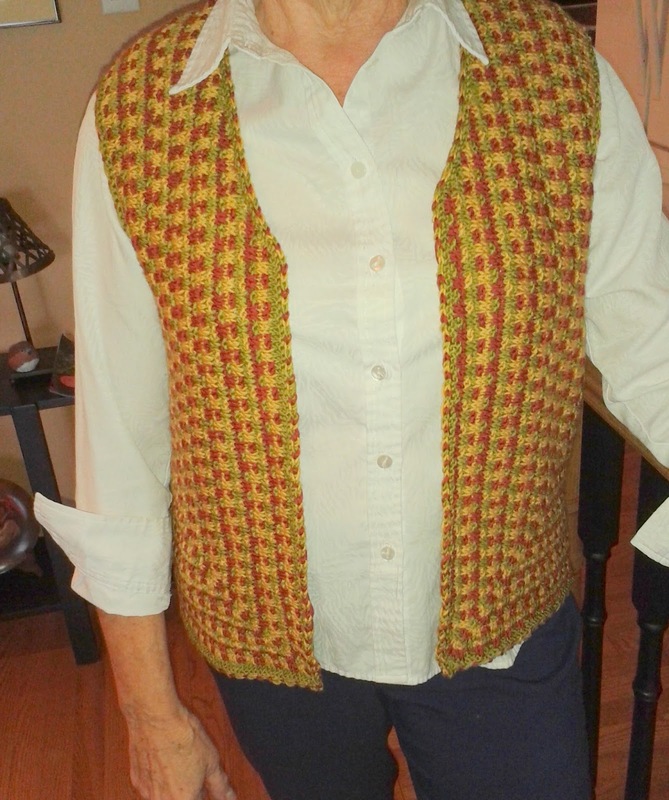 Grief and love - all in one vest. Pattern: Serendipity Vest. Enough said. Yarn: Selridge Yarns, DK weight, Superwash, Hand dyed wool. Gorgeous touch. Gorgeous colours. Gorgeous to work with. Mods: Two mods that are all combined into one. 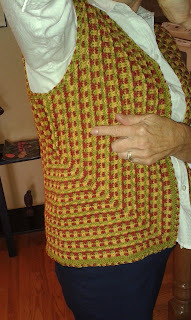 From the Patternfish photo in the link above, you can see that the vest, as designed, has borders. Mine doesn't. Why not you ask? 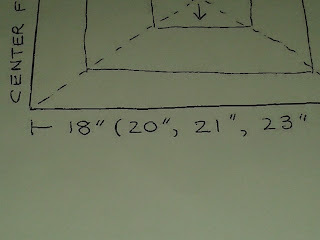 Well the pattern, as written, is a shorty design. On me I thought it might look too boxy, giving my profile the appearance of more pounds that I care to carry. For that reason, I wanted mine longer. But - and this is a big but - with this design, the pattern is knit in two pieces only. Centre back to centre front, times two. The knitting starts at the underarm with an invisible cast on. The front and back are widened and the bottom lengthened with the working of each row, through the use of mitered corners. 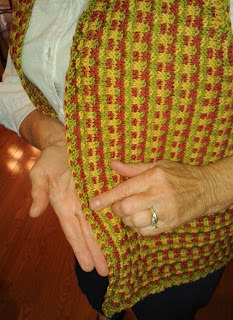 The cast on and beginning of the vest is just beyond my finger - the green row with gold on each side, right under my arm. You can see the front miter flowing from that start point. 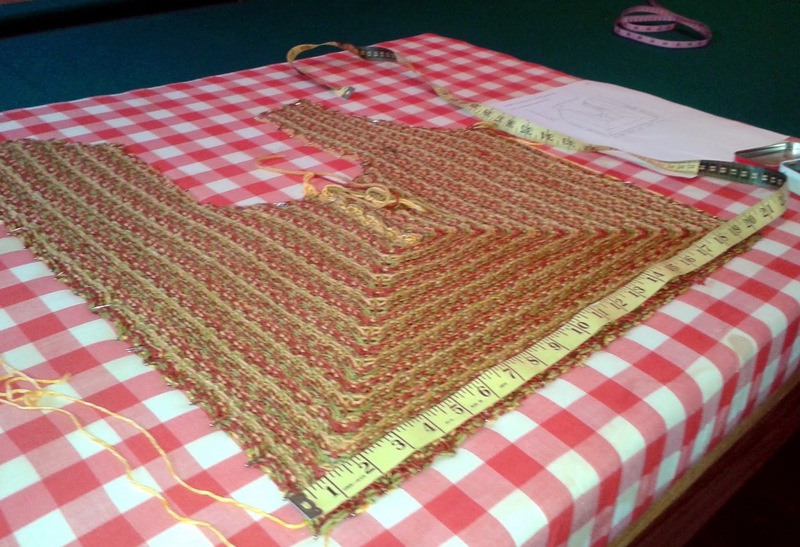 What the two piece, mitered construction meant is that unlike most patterns, where adding length is no problem, with this design, length and width are Siamese twins. 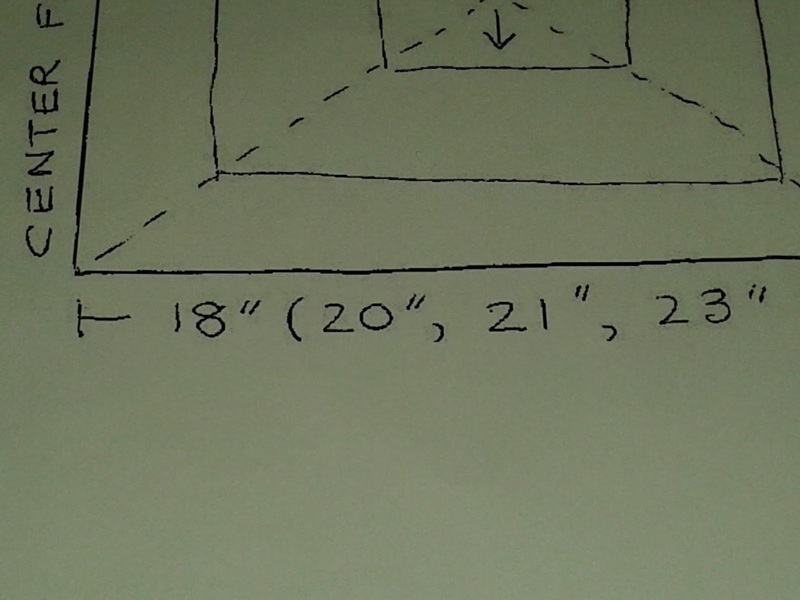 I could not add the length I wanted without also adding width. 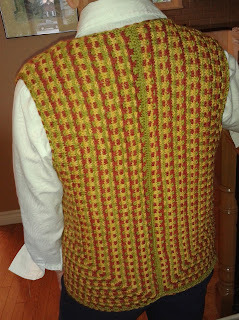 Having decided on the extra length, when finished, I already had enough vest width. 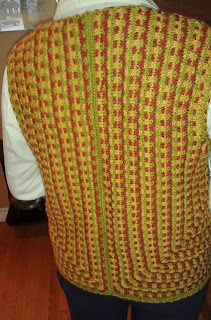 The borders would have added another two inches and that would have made the vest way to wide for my liking. 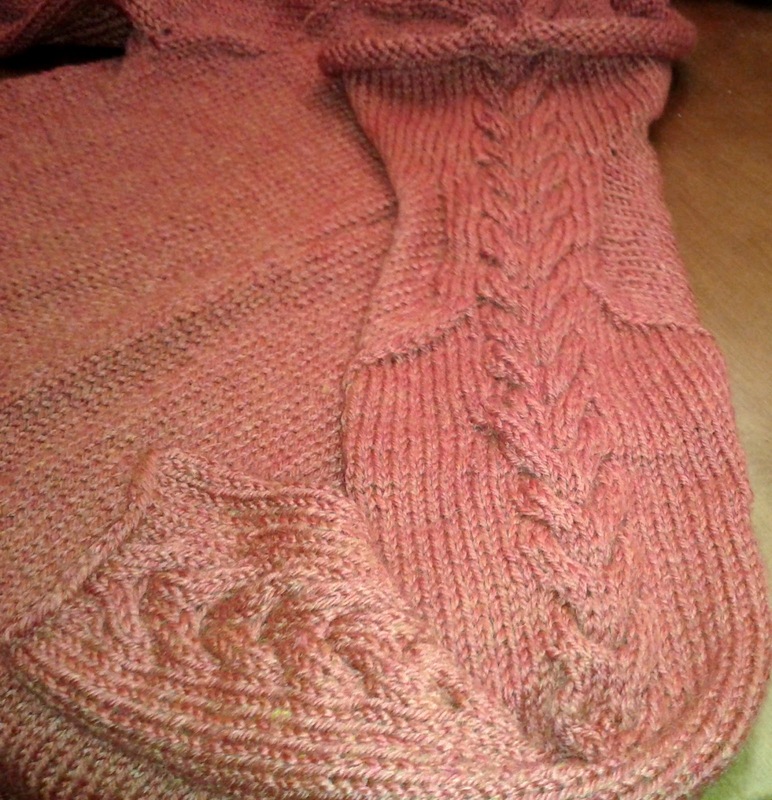 What I did instead, was to work one ridge of garter, then work the three colour cast off as suggested in the pattern. I really like that cast off. 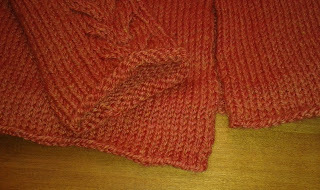 You simply knit one stitch with main colour, knit one with contrast colour #1, cast off. Work one stitch with contrast colour #2, cast off. Repeat. 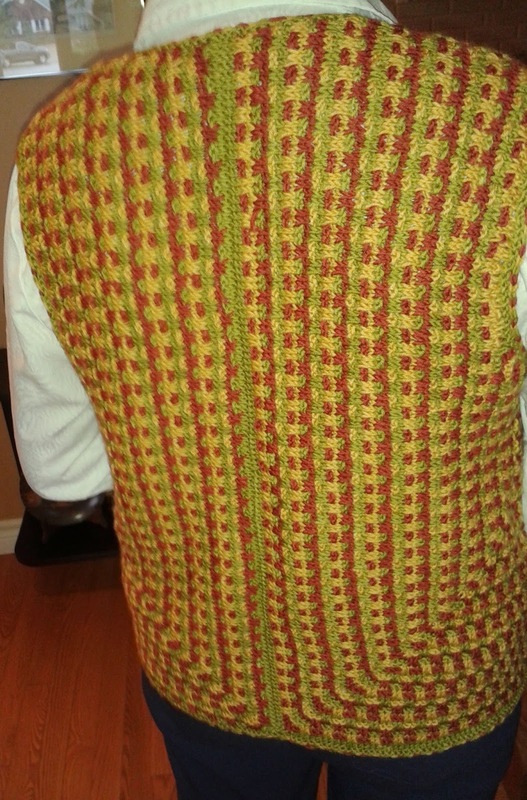 Very clever and it is the perfect cast off for this three-coloured vest. Notes of Interest: Both the underarm seams that started with the invisible cast on and the centre back seam are joined together with a Japanese Three Needle Cast Off. 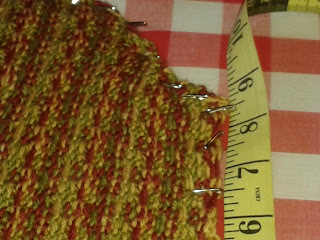 A new one to me but easy to do and it gives that extra row of joining-colour as a great design feature. 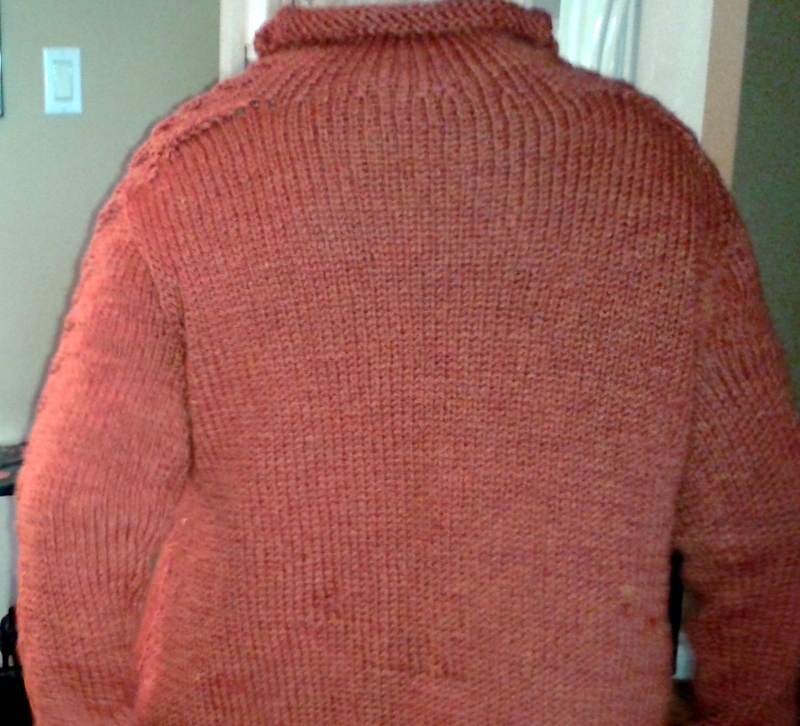 Despite the pattern confusion, it was a fun knit and I am very happy with the end product. The colour combo I chose specifically for fall wear and I love it. The fit is great. 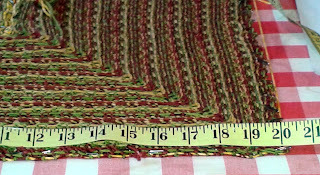 The slip stitch pattern was easily memorized and easily 'read' when decreases or increases altered the row ends. My no-border look gives my version a more trendy, au courant look, I feel. I like that. 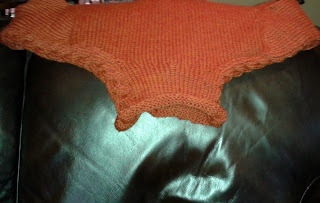 The yarn is deliciously soft, didn't split at all and has given me a great end product. So - grief forgotten, I love it. 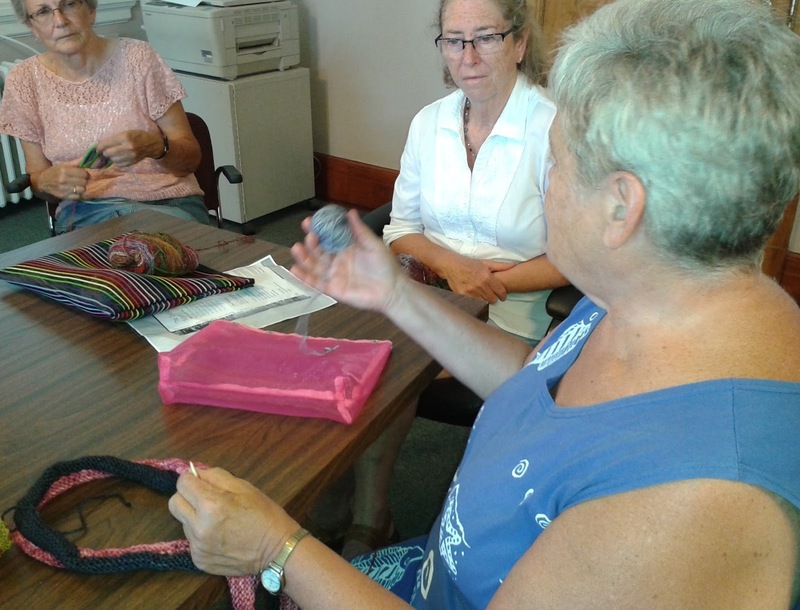 With the weather more summer-like than some of our summer days, one might think that perhaps it was too hot to knit. But oh so wrong one would be. Jean brought these cute little worker-dude boots to show us. Have you ever seen anything cuter? Although I didn't hear her say, I imagine they are for the Spinners and Weavers Guild sale in November. Deana and Sharon R were both working on projects from the Knitters Fair. Deana Fair purchases included a bag of 'minis' to make a cowl. Bands of knit and purls. When one yarn runs out, it is time to use a new colour and change from rounds of knit to rounds of purl or vice versa, she explains. 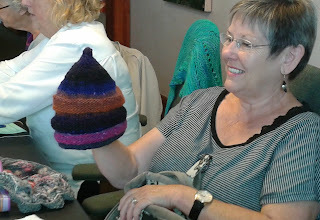 Sharon, among other things, bought three Noro hat kits. Number one is well on the way to the crown. You can't beat Noro for wonderful colours. Sharon who missed our trip to the Knitters Fair last Saturday due to a family wedding, has a gorgeous Noro scarf on the go. 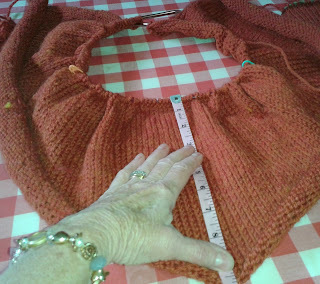 Carol - sorry Carol, I was so intrigued with the knitting I forgot to include you in the picture - has started a skirt for her daughter. Lots of 'haute' styling there. It was good to see Ingrid back after her summer travels. Can you see that little piece of pink knitting in her hands? Another dress, she says. Little, tiny pieces that she will crochet together. And yes, that is my Serendipity Vest in the foreground. Finished and ready for cool weather. I'll tell you all about it tomorrow. Given that I no longer enjoy the self-imposed pressure to post daily (or almost daily), I have made a decision. I am going to continue blogging but make the blog a 'Special Occasions' blog. This will alleviate the feeling that I must/should be posting frquently but still give me the enjoyment of keeping in touch when something special has happened in my knitting world. Like today for instance. I have finished an Eternity Scarf for my Christmas basket. 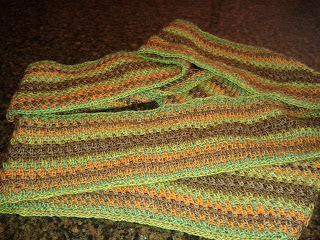 and other than yesterday's marathon to the finish line, I knit crocheted this up in a little over a week. 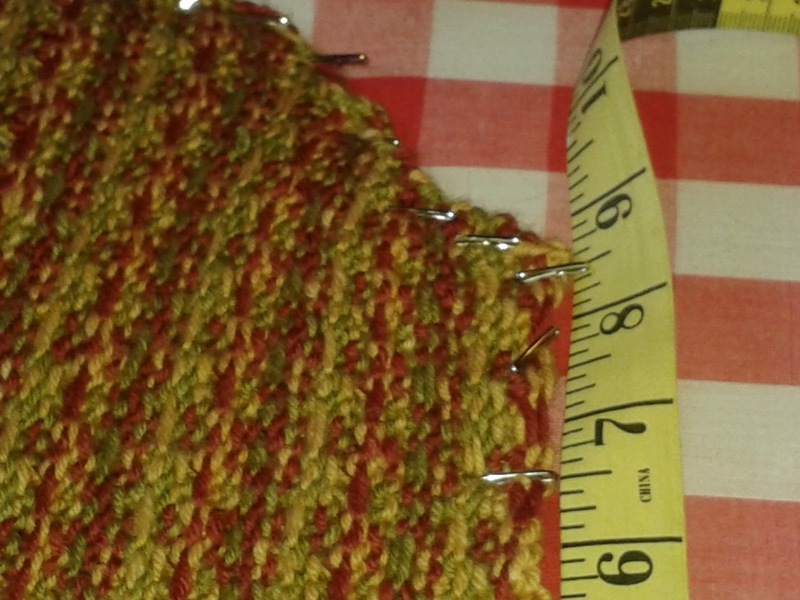 It is a crocheted adaption of the knitted Linen Stitch. Having done both, I can sure vouch for the speediness of the crocheted version. The pattern, a freebie from Estelle, is a simple repeat of single crochet and chain stitches. 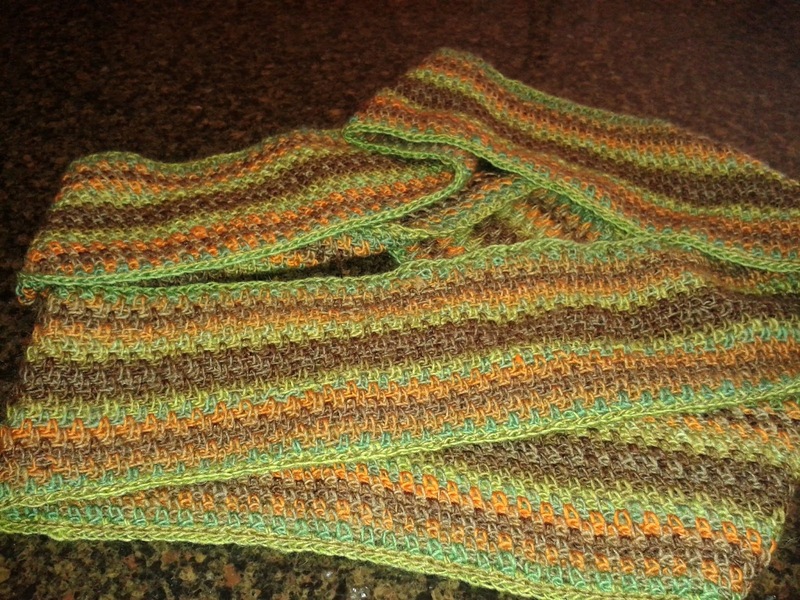 I modified mine, joining it in the round after a few rows as I wanted an Infinity scarf. If I were to do it again, I would probably use 300 stitches to start. The 400 stitches go around my head three times, so I feel certain the 300 would be long enough and give the scarf more width. And in the spirit of two for the price of one, another Special Occasion happened on Saturday. It was the annual Kitchener Waterloo Knitters Fair. There, I ran into Patrick who now owns Signature Yarns. 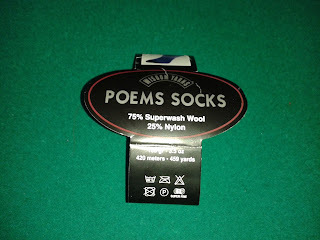 Patrick is a one-of-a-kind guy and I came to know and love him when we worked together at London Yarns, many years ago. Saturday, he insisted that I try on one of his display garments. The one that was clearly out of my price range but - oh - so gorgeous. Talk to you at the next 'Special Occasion'. 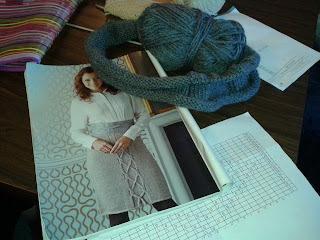 Laid out, with the centre underarm pinned as it is meant to be sewn, I think the first half of Serendipity looks right. On to the second half.